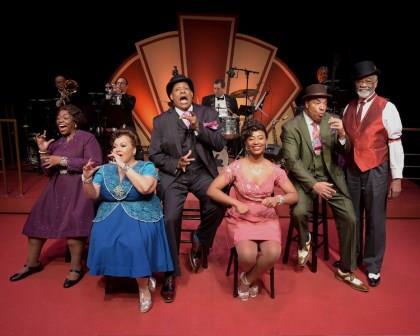 Even without a spoken line, save one, “Ain’t Misbehavin’” provides insight into the life and times of Thomas “Fats” Waller. Born in 1904 and dead too soon in 1943, his dream of becoming a ‘serious’ composer (like George Gershwin, whom he much admired) was derailed by racial barriers. Falling back on his comic persona and swinging style, he left instead a legacy of jazz and blues that profoundly influenced Count Basie, Teddy Wilson, Dave Brubeck and others. In retrospect, Fats did indeed compose serious music. A compilation of his melodies (Fats wrote the music; various collaborators, the lyrics) and some others’ songs that he memorably recorded, the revue is set in a Harlem nightclub in the 1930s, illustrated by the costuming, the arrangements and the presentation. 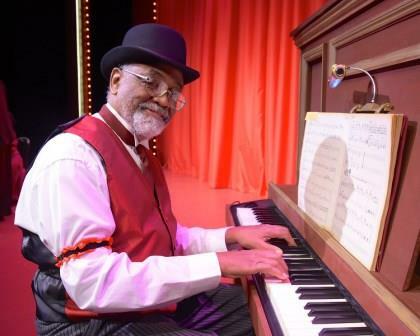 If there is a hint of minstrelsy, it is in the service of that time and place; performed here unabashedly, it is history – not academic, mind you, but a replication, as entertaining as it is authentic. Five top-notch talents (and a nifty back-up band) bring new life to old songs, some of which might be familiar even to relatively younger folks, “I’ve Got a Feelin’ I’m Falling” and “Two Sleepy People” for two. The show segues seamlessly from song to song, including less familiar tunes that are well worth discovering. The tightly harmonized ensemble numbers are terrific. The title song kicks off the show with a blast, and “The Joint is Jumpin’” ends the first act on a high. “Spreadin’ Rhythm Around” does just that, and “The Jitterbug Waltz” is stuck in my head a week later. Each performer also has solo turns. M. Martine Allard’s emotional “Mean To Me” and Ron Lucas’s seductive “The Viper’s Drag,” (“The Reefer Song”) resonate. Tony Perry’s take on “Your Feet’s Too Big” is a comic gem, and his and Lucas’s “The Ladies Who Sing with the Band” is an apt tribute. Amy Jo Philips’s “Squeeze Me” is an offer you want to accept, and Anita Welch makes you believe that she’s “Keepin’ Out of Mischief Now” (or maybe not). All these and more (about 30 total) are accompanied by music director William Foster McDaniel at the piano, fronting the five piece band as a latter-day Fats Waller. 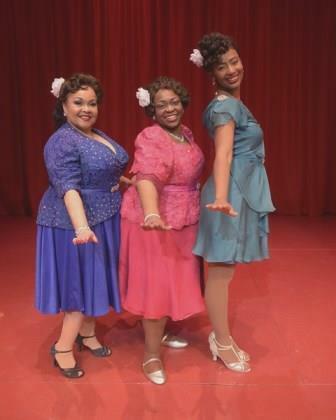 “Ain’t Misbehavin’” includes a musical statement that puts the show in perspective. Fats Waller wrote “(What did I do to be so) Black and Blue” in 1929 with Andy Razaf, his most prolific lyricist. The blues song is a treatise on bias, both white racism and that directed toward African-Americans with varying skin tones. Sung a capella in multi-part harmony, it is hauntingly beautiful. Celebrating the show’s fortieth anniversary year, Westchester has snagged its creator and original director, Richard Maltby, Jr., who also contributed some lyrics (with co-creator Murray Horwitz), to helm this milestone production, and a smooth one it is.